In the mood for dancing, want to become tech savvy, or meet new friends, check out our social club activities in Bolton Street. 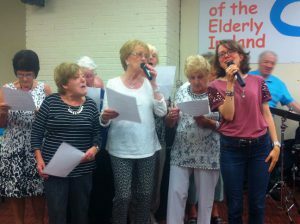 Friends of the Elderly’s social clubs aim to bring older people in Dublin together to enjoy a range of different activities. The clubs are run by committed staff and volunteers who are there to provide support to our older members. Whether it is to drop in for a coffee, a chat, to learn how to use different forms of technology, singing and dancing and a lively atmosphere, our clubs are here to provide a warm and social atmosphere for the older generation in the community. The clubs are very informal so you can join in as little or as much as you choose. They are ideal for older people who are able to get out of the house and want to join us in Bolton Street. If you want to try out our activities while making new friends check out our social club brochure below.